Quit googling “israel internships summer 2019”. If you're considering an internship in Israel in 2019, you've come to the right place. Not only does this article have the longest list of internships, it has answers to common questions, success stories to inspire you and help you choose, many Israel flag emoji and even a downloadable spreadsheet you can use to keep track of your applications. Do you know anyone who has already done an internship in Israel? Start by downloading your spreadsheet copy (will open in a new browser tab). Next, go through the internships list below, using the spreadsheet to note which programs to apply for, and later, track your progress. Keep in mind as you go through the list is that while some of the internships listed below are paid, many have significant fees to cover besides airfare and living expenses. How will you fund your Israel internship? Funds and scholarships – apply for funds and scholarships, such as Keith Berman's fund. Top Israel Interns has a great list of scholarships on their site. Also, many of the organizations listed offer their own scholarships, such as WUJS Israel. Many of the internships do specifically say they're aimed at Jews, but not all. If you're not Jewish, avoid organizations that specifically mention Judaism or Zionism in their name or internship description. If you take a look at the success stories, you'll see a few are from non-Jews. Any internships for Israeli students? Most of the programs are aimed at giving foreign students an authentic Israeli experience, which is why they often have fees such as for travel and accommodations. However, there are a few programs and openings that anyone can apply for, including local students. Basically, if the description doesn't mention the above fees, there's a good chance it's open to Israeli students as well. The internship I want is no longer available, or the deadline has passed. If there's an internship that interests you but the application deadline has passed, you should still reach out to the organization. On the one hand, there may be some flexibility if the application deadline was recent. On the other hand, last minute cancellations mean open spots for you. Ultimately, the list is like a job board. It's up to the organizations featured to update about any changes to their listings. What are the benefits of going through an internship placement program as opposed to applying to companies directly? We provide accommodations. For a foreigner it can be quite tedious and difficult to find and lease an apartment. We take care of all of that for our participants so they don't have to. We provide social events for our participants. Our participants have weekly evening activities with their madrichim and day trips where they have the opportunity to explore the country. We also provide Career Advancement programs that include but are not limited to workshops on public speaking and entrepreneurship! TopIsraelInterns.com – “provides prestigious internships in a wide variety of fields and professions. Their 6-week Summer programs, and 5-month programs (Spring, or Fall), are perfect for those looking to boost their career, and enter the job market. Explore their internship options today.” SPRING 2019: January 21 – June 6. Full program cost (without Masa Grant) $7,500; Full program cost (with Masa Grant) $3,000-4,500; Program without accommodation $5,500; Internship only option $1,000; Additional costs: Utilities $750 ($150 will be refunded at the end of the program). At this point, we send you all the necessary forms to fill out. This includes a link for the Masa Grant application, and our program acceptance form. We also request that applicants send us their resume and cover letter, and make a down payment of $200 for us to begin the search for your ideal internship placement. General Paralegal for Internship- March 2019 – IBM is committed to creating a diverse environment and is proud to be an equal opportunity employer. All qualified applicants will receive consideration for employment without regard to race, color, religion, gender, gender identity or expression, sexual orientation, national origin, genetics, disability, age, or veteran status. IBM is also committed to compliance with all fair employment practices regarding citizenship and immigration status. WUJS Israel – “over 400 customized internship and arts placements. Options include: high tech, medical research, journalism, TV, new media, marketing, human rights, politics, photography, film production, visual arts and more. As a WUJS intern you’ll learn Hebrew in our private Ulpan, and learn more about the country with weekly trips exploring different areas and themes in Israeli culture. You’ll also develop friendships with Israeli students who also join the program’s activities.” WUJS Intern Spring 2019 Semester: January 10, 2019 – June 6, 2019. WUJS Intern Fall 2019 Semester: August 12, 2019 – January 5, 2020. AMIRIM – The WUJS Summer Experience – The perfect blend of structure and freedom to explore Israel on your own. You choose the length! 4 or 8 week options. You choose the location! Tel Aviv, Bat Yam and Jerusalem. Option to combine Jerusalem and Tel Aviv in one summer. Rich itinerary of inspiring day and overnight tours relating to Judaism, Israel and the Middle East. Live in apartments with Israeli students your own age! Registration has closed but you can still get on the waiting list. Taglit Birthright Israel's Business Experience Program – a 10-week internship program for students pursuing careers in business and technology. Candidates who are accepted into the program are assigned to an internship in Israel in fields such as finance, venture capital, consulting, and technology. Throughout the summer internship, Fellows can expect to gain in-depth knowledge and experience from high-level executives. Birthright Israel Excel Fellows become an integral part of the team in the office. There was a recent writeup about the program in the Jerusalem Post. Abraham Hostels & Tours Programs – Intern at Abraham Hostels & Tours is defiantly a life changing experience! Enjoy a unique, practical work experience in Israel through our Internship programs at the Abraham Hostels & Tours. If you have the ability and initiative to lead projects without too much supervision, you are the perfect candidate for this program. Find the right internship for you and apply now. The TAMID Group Fellowship – a competitive, 8-week summer internship program that provides outstanding TAMID Group leaders with the opportunity to work with host companies in Israel while living in Tel Aviv or Jerusalem. TAMID Fellows come from a range of backgrounds, including business, computer science, and liberal arts. What they have in common is a strong track record, inside and outside the classroom, and a desire to tackle and complete substantive business projects that will contribute to their company’s growth. Past projects addressed challenges such as pricing strategy, supply chain, market research, digital marketing web development, beta testing, competitor analysis, financial modeling, and more. Jinternship.com – Internships with Jerusalem-based companies in every field for Jewish college students who want a unique opportunity to intern in Israel and explore their Jewish heritage. Costs range from $350 up, depending on the length of the program, and include room and other amenities. Shurat HaDin’s Internship Programs – Shurat HaDin’s internship programs provide law students with a unique opportunity to play a role in the fight against terrorist organizations and states or institutions sponsoring terror. Students will work in a dynamic environment with volunteer lawyers from around the world. Our program is not found at other institutions or non-government organizations and the acquired experience is invaluable, providing you with an edge when competing for a post-graduation job. Onward Israel – Onward Israel offers a competitive and attractive venue for young people seeking such experiences at affordable prices, and for time periods ranging from six to ten weeks. While meeting the individual needs of the participants and allowing them to advance their resumes, Onward Israel speaks directly to the interests and concerns of young adults entering the labor force in a globalized world. Our programs maximize opportunities for cross-cultural immersion, a feature that is highly prized by employers and academic institutions. Summer in Jerusalem – “OU-JLIC, Bnei Akiva/TVA and Mizrachia are organizing an opportunity for college students to live, learn and work in Jerusalem. Join us as we create an exciting social and religious summer community in the heart of the Old City!” For religious college students, both men and women. Participants will live together in Jerusalem, work in an internship of their choice during the day and study Torah in the evenings. ($700 Early Bird – application received by January 15, 2019. $870 Regular. Includes: housing, personalized internship placement, Beit Midrash program, and Shabbatot.) When: June 19 – August 4, 2019. Aardvark Israel – Participants of our Israel gap year programs are given a wide range of choices and are placed at sites that match their interests and skills for the duration of each semester. You will volunteer three to four mornings a week, giving you the chance to build your resume, interact with the Israelis, and contribute to Israeli society. In addition to the numerous options you will be given, the staff is available to identify additional options to suit your individual preferences. Torah Tech Elite Gap Year Program – Torah Tech is a unique gap-year program in Israel for young men that integrates intensive Torah study with professional development through business internships. Students will also connect to the land of Israel through exciting trips and tours, give back to the community through chessed projects and volunteer work, hear from distinguished religious personalities from both the Torah and corporate worlds, and enjoy exclusive access to nearby gyms, men-only beaches, self defense training courses, and much more. Big Idea Gap Year – BIG IDEA Gap Year PLUS is a five-month internship extension program. Use your knowledge in developing mobile and web application and gain more hands-on work experience. Be a part of the Israeli hi-tech industry, intern in Israeli Hi-tech company. Travel and explore Israel, work on your Hebrew and live independently with your friends. Spring semester 2019: Feb. 11 – Jun. 10, 2020 ($12,950). Fall semester 2019: Sep. 2, 2019 – Feb.3, 2020 ($14,950). Spring semester 2020: Feb. 10 – Jun. 9, 2020 ($12,950). Full Year experience – with Tel Aviv Internship ($23,950) New – Up to $7,200 masa grant! Did you download your spreadsheet copy yet? It contains all the internships listed here and their contact information in an easily sortable format you can use to track which internships you applied for. The Global Intern – An internship abroad is an amazing experience that will have a profound influence on you today and throughout your future as a professional. For the same cost as just three to six credits at an American university, a global internship will: Make you stand out from the crowd, both in your resume and graduate school application; Offer you an authentic experience abroad, where you immerse yourself in a unique culture as a local, not just as a tourist; Give you a leg up in the job market with highly-valued international work experience, something especially important to international firms; Put your classroom lessons into action by applying them to real world situations; Start your lifelong process of building quality professional contacts, essential to your career growth now and in years to come. Windows – Channels for Communication (AKA Windows for Peace) – Interns and volunteers with Windows are offered a unique opportunity to work within an organization with 25 years experience of peace building education: learn about the complexities of the Palestinian-Israeli reality and contribute to the promotion of just peace. Internships are available at our Tel Aviv-Jaffa office doing social media, fundraising, events coordination, web development or translation work. Minimum of 3 months/15 hours per week. There are internship positions available year-round on their website. Israel Forever Foundation – Internships are an incredible way to expand your professional experience. As an intern with Israel Forever, you will be actively involved in the fulfillment of our mission to connect Jews around the world with Israel. Opportunities are available in our main centers of Washington DC and Israel, or as a part of our “virtual office” from your corner of the world, allowing our team to reflect the international nature of our global community. Arava Institute for Environmental Studies – Each year, the Arava Institute accepts interns for 2-12 months who focus their research in one or two of the research centers. Interns contribute substantively to trans-boundary research through a defined project under the direction of a faculty member, while gaining a valuable professional, academic, and personal experience. Interns develop skills in environmental research and development, environmental policy, and project management; gain important professional contacts and build effective community based partnerships; and become a vital part of the global network of accomplished Arava Institute alumni. The Arava Institute welcomes interns from varied backgrounds, including the social and the natural sciences. We are now accepting internship applications for Spring 2019 and Fall/Autumn 2019 semesters. To apply for an internship, and to learn more, click here. Masa grants are applicable. Israel by Design – Your Israel by Design program gives you the chance to work in a wide variety of skilled volunteer or professional work placements, providing a unique hands-on experience of Israeli society. We arrange your volunteer or internship activities according to your needs, skills and interests, and you decide how many hours per week you want to commit to. Of course, you can choose to volunteer or work in one place or several and divide your time accordingly. Masa grants are applicable. Way More Israel – co-ed, ages 19-28. You will spend an incredible period living in Jerusalem’s historic Old City while learning Hebrew, volunteering and building your career. The opportunity to live like a local will give you an authentic Israel experience. With trips, classes/workshops on timely Jewish topics and amazing internship positions, you’ll get way more than you ever imagined. Our grants and partnerships allow our program to be the most affordable program out there. Summer 8-week session: June 23 – August 15, 2019; Fall 5-month session: August 29, 2019 – January 24, 2020; Spring 5-month: January 29, 2020- June 22, 2020. Apply Now! Israel Government Fellows – Israel Government Fellows (IGF) is a unique and selective 10-month leadership program founded by The Menachem Begin Heritage Center in partnership with Masa Israel. Endorsed by the Office of the Prime Minister of Israel, IGF offers young Jewish professionals from the Diaspora an internship at the heart of Israeli government, in a variety of government ministries and policy related NGOs. Additionally, our fellows participate in weekly seminars, addressing core issues in Israeli society: geopolitics, economics, religion, minorities, culture, international relations and others. In these seminars, our fellows have the opportunity to engage in discussion with top academics, activists, journalists, politicians and lay leaders who span a wide range of political and religious ideologies. IGF also includes Hebrew studies in Ulpan and trips around the country, all with a diverse group of young and ambitious leaders from all around the world. IGF is the only existing program of its kind for non-Israelis! It is available for young Jewish people aged 22-30 with a Bachelor’s degree or higher. IGF's 14th session will be held September 2019 – June 2020; go to www.igf.org.il to learn more and apply. iTrack – iTrack is a personalized 5-10 month Israel experience program that is designed for young adults between the ages of 18 and 30. The goal is for each participant to build a program that suits his or her specific needs and desires. Every participant, together with the iTrack staff, builds a program that suits the experience that he or she wants to have while in Israel. All programs include Ulpan and monthly excursions and cultural events in order help you to get to know Israel. MASA grants are available which can help significantly reduce the cost of your program and priority is given to participants receiving grants. Pardes Institute of Jewish Studies – The Pardes Year Program offers you the opportunity to delve deeply into Jewish ideas, texts and personal questions – empowering you to make Judaism your own. You’ll come away with skills, knowledge and inspiration under your belt, a lifelong community of passionate peers and mentors, and the life-changing experience of living and learning in vibrant, fascinating Jerusalem. The Pardes Year / Semester Program (full-time option) is powered by Masa Israel Journey, which offers generous grants, educational enrichment and leadership development to eligible participants. Spring Semester 2019: Jan. 16, 2019 – May 31, 2019. Fall Semester 2019: Sept. 3, 2019- Jan. 9, 2020. Spring Semester 2020: Jan. 15, 2020- May 28, 2020. Contact registrar@pardes.org.il for more information. Masa Grant applicable. Applications are still being accepted for the 2018-19 Year Program, with financial aid allocated on a first-come, first-served basis. Preferred application deadline for Spring 2019: December 3, 2018. Preferred application deadline for Fall 2019 and Year 2019-20: March 31, 2019. Tel Aviv University Study Abroad and Internship Program – Are you looking to gain global professional experience while studying abroad? 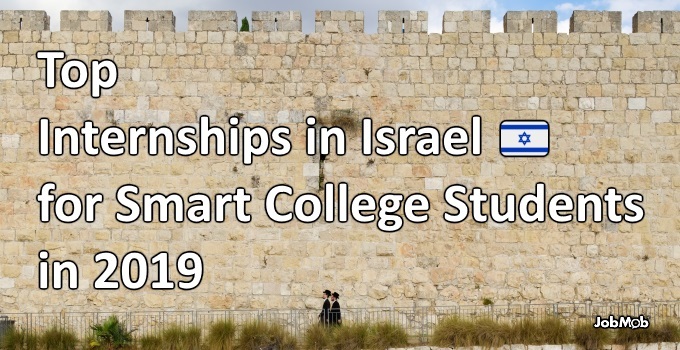 Tel Aviv University and Masa Israel Journey are excited to announce the launch of a new initiative that connects international students with a professional internship in their field of interest. Application Deadline: Spring Semester: November 1, 2018, Fall Semester and Full Year: April 7, 2019. Admission Requirements: Open to undergraduate students enrolled at accredited institutions of higher education with a 3.0 GPA (80/100). Program Dates: January 15 – July 26 (Spring 2019), July 25 – May 26 (Year 2018-19), June 10 – July 26 (Summer 2019), August 4 – December 20 (Fall 2019), August 4 – May 15 (Year 2019-20). Lirom Academic Internships in Israel – Lirom Global Education offers students from around the world the opportunity to partake in a semester-length internship in Israel… Our Internship Placement Coordinator will work directly with you to find your ideal internship. Here are some of the fields we currently offer internships in: Hospitality, Culinary Arts, and Education. $500 placement fee – which covers up to 2 placements. $50 registration fee. Intern with ACRI – For winter 2019 (February-May 2019) please submit applications by December 31st 2018. Primary response to these applications will be sent by e-mail only after due date. For Summer 2019 (June-July 2019) please submit applications by 1 March 2019. Primary response to these applications will be sent by e-mail only after due date (1 February 2019). If you are a law student or lawyer and are interested in pursuing a legal internship at ACRI, please contact Attorney Tal Hassin at talh@acri.org.il. We offer internship positions for a period of 4-8 weeks usually in our main office in Tel Aviv. In some cases the internship can also be full or part time from our Jerusalem and Nazareth offices. Please note that internships are unpaid and applicants are therefore encouraged to secure public interest fellowships or other sources of funding. The internship is open to applicants from Israel and from overseas. For application please submit your CV and a cover letter. Destination Israel – An incredible international experience – in English – with other 18-30 year olds from more than 37 different countries! Internship in your field of interest. Shared apartment in Tel Aviv or Yafo (you choose!). Modern Israeli Hebrew ulpan. Masa Grants are applicable. Tikkun Olam in Tel Aviv-Jaffa – A joint program of BINA: The Jewish Movement for Social Change and The Daniel Centers for Progressive Judaism. Be a Part of Social Change in Tel Aviv-Jaffa: Live, study, volunteer, & explore Israel, with Israelis! Make a difference in the communities where you live. With over 10 years of this program, there are so many options to choose from to volunteer or intern. Placements in the fields of social justice and coexistence. Gain real work experience in Tel Aviv-Jaffa's nonprofit sector. Study the Jewish bookshelf with a modern perspective at BINA’s innovative Secular Yeshiva and The Daniel Centers’ progressive Jewish community centers throughout Tel Aviv-Jaffa. Explore your Jewish identity and complex issues facing Israeli society. Learn Hebrew too! Live with a community of your peers from all over the world, including Israelis! Eligible participants are 21-30 years old. Spring Semester 2019 (5 months): February 4 2019 – June 20 2019. Fall Semester 2019 (5 months): September 2019 – January 2020 (Exact Dates TBA). Full Year Program 2019-2020 (10 months): September 2019 – June 2020 (Exact Dates TBA). Email tikkunolam@bina.org.il for more information. The Magshimey Herut Internship Program – The Magshimey Herut Internship Program is here to help you try Israel on for size. If you’re looking for something flexible, want to gain valuable experience, learn about Israeli society, and want to follow your own schedule, than THIS is the internship program for you. Magshimey Herut offers tailor-made internships in the field of your choice. Tell us what you are looking for, and WE will find an internship for you. Friedrich Ebert Stiftung Internship – Are you interested in Middle East Politics and especially in the work of the Friedrich Ebert Stiftung in Israel? Please consider that due to strong demand we are allocating our internship positions about one year in advance. Internship positions will be available only starting July 2019! Please send your documents with the preferred period for your internship by e-mail to: Sonja.Lebkuecher@fes.org.il. Please consider that due to strong demand we are allocating our internship positions about one year in advance. Internship positions will be available only starting January 2020! Next Step Israel – Next Step Israel Internships is the best way for teens to build career skills and explore their identity in the land of Israel. Our interns will spend 5 weeks interning with Jerusalem area companies and organizations. On the weekends, we depart Jerusalem and tour in cities like Tel Aviv, Tiberias, and Tsfat. Our weeknights are spent unwinding from our work day, touring local Jerusalem cultural and tourist attractions, developing our work skills through group sharing, and building our skills through workshops with local experts. Ramah Asiyah Internships in Israel – Ramah ASIYAH, our study/internship program in Israel, offers rising high school seniors an opportunity to develop their academic and professional networks through training and shadowing/interning with established professionals in a variety of fields. In addition to the internships, this summer’s program will include a variety of workshops, such as how to create an effective resume and how to translate the summer internship into a persuasive college essay. Summer 2019: June 25 – August 5. AgroStudies Internship Program – Agrostudies is an organization that provides a unique apprenticeship in agriculture, combining advanced studies and hands on ‘learning by doing ‘ in various fields. We collaborate with dozens of carefully selected farms across Israel, to ensure each student is nurtured in the most enabling and stimulating learning environment, allowing them to benefit from real exposure to the most advanced agricultural working methods. Classes are taught once a week on three campuses, one in Tel-Hai College in the North (nearby Kiryat Sh’mona) another at the Ruppin College and a third in Kfar Silver. In addition, each group is assigned a tutor who accompanies them throughout their internship, based on their area of study. Taub Center for Social Policy Studies in Israel – The Center provides interns with the opportunity to be “a big fish in a small pond,” interning in a small organization that has a great deal of impact and influence, and taking on high-level work that is core the Center’s mission. Hours are flexible, and while the position is unpaid, the Taub Center goes to great lengths to mentor interns and build a meaningful, valuable experience. We will gladly provide documentation for university or college credit upon request. Herzog Fox & Neeman Law Office – We are looking to recruit the best and the brightest students to come and join us as interns. Our ideal candidate will have top grades and the commitment and motivation to work hard to succeed. We are always looking for motivated qualified lawyers from outside Israel who are moving to Israel, especially those from the USA, the UK, Canada and Australia. We are keen to recruit talented and experienced lawyers who can help us develop our international practice in a wide variety of practice areas. Please send your current resume or CV and a cover letter setting out your plans for moving to Israel and any other information you feel we should know to Alan Sacks (jobs@hfn.co.il). We will not contact current or former employers without your approval. Bee Creations Design Internship In Israel – Bee-Creations invites visual communications students from all around the world to have their professional internship at our design studio. We accept talented designers in the fields of interactive design, print design, web design and typography. If you’re interested in working in a high standards design house, with cool fellow designers and interesting projects, you’re welcome to send us your resume and some samples of your design work. Stratasys is looking for you! – DO·ER /ˈdo͞oər/ n. 1. someone characterized by action, as opposed to contemplation. 2. a person who gets things done with vigor and efficiency. synonyms: achiever, organizer, go-getter, executor, producer, developer, dynamo, builder, maker, you. Become part of our fast-paced, global, market-leading technology company. Junior Financial Planning & Analysis Student/ Graduate or Industrial Engineering Student. J.P. Morgan Tel Aviv & Herzliya – Come join us in Israel. Our Investment Banking team is impacting companies in Tel Aviv and reshaping the entire industry. In Herzliya, our Technology team is developing innovative products and new ways of doing business. J.P. Morgan Investment Banking Analyst Program – Internship: This nine-week program starts with virtual training, followed by five days of classroom instruction on markets, credit analysis, economics, financial metrics and Excel. Through hands-on experience and ongoing education, you’ll participate in trading simulations and learn more about global market strategies and asset classes – equities, credit, foreign exchange, commodities and emerging markets. Software Engineer Internship: You should have excellent coding skills, be able to manage relationships with clients, and have exceptional problem solving and analytical thinking skills. We’re looking for those who are intellectually curious, collaborative and open to new challenges, as well as being able to take ownership of projects to bring them to fruition. Investment Banking Seasonal Analyst Program: We’re looking for excellent problem solving, organization and communications skills. You need to have strict attention to detail, be a quick learner, and enjoy working in an ever-changing, fast-paced environment. We’re looking for flexible, adaptable, analytical thinkers who bring a comprehensive knowledge of global markets and a strong interest in financial services. You should have excellent business writing, research and quantitative skills. Being client and solutions focused, collaborative and executing work with integrity are a must. Facebook in Tel Aviv, Israel – Facebook’s mission is to bring the world closer together, and we’re just getting started. We’re looking for talented people who love to build things and are bold enough to tackle complex issues that make the world better for everyone. We move fast at Facebook, so you’ll have the opportunity to make an impact on your very first day and every day after. Facebook's job board currently lists 6 types of internships in Israel. Search LinkedIn for Israel-based people with the keyword “internship” in their profiles. Results will include internship coordinators and former interns, both of whom might be able to connect you with a new opportunity. You can also search with the word “fellowship” instead. Or you can just search for internships directly here. Many companies, especially large multinationals, offer internships in Israel. Their members may need someone like you, and the local chamber could facilitate the matching. Also fellowship-oriented, Aish has a number of different fellowship programs to choose from. Heard of any other internships to add to the list? Or maybe the list already has too many Israel flag emoji? Tell us in the comments. Subscribe to JobMob via RSS or email and follow me on Twitter for all you need to get that first foot in the door for Israeli work experience. Sincere apologies, Huang, and I appreciate you taking the time to point out the mistakes. Of course, there was no harm intended. I’ve now made the corrections you requested above.